Little Odd Forest – where bags, bibs and booties aren’t odd at all! I love a one stop shop, I really do. 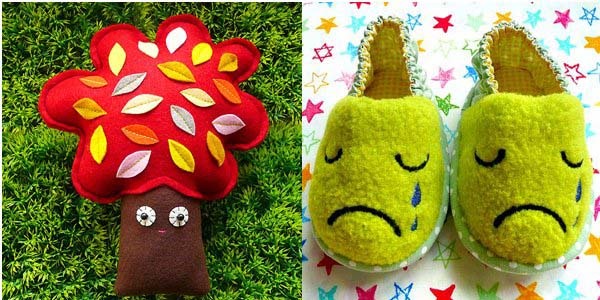 Little Odd Forest creates the grooviest bags, toys, shoes and knick-knacks I’ve seen in a long time and there’s plenty to kit out the smallest people of all! The fabulously talented Lynda Lye is the designer and creator behind the goodies you see here. I love that she hasn’t shied away from emotion, with cheeky grinned bibs, sad teary booties and happy trees. It makes sense, after all we see these emotions every day! I love the felt toys – the rich colours and appliquéd leaves of the Forest Treeling make my heart sing. I’m sure my daughter would love to sink into a bed covered with these bright goodies. The Cheeky Monster bibs are especially cheeky and I’m sure there will be a few laughs when children pull similar faces from across the table at meal times. Continue the Cheeky Monster theme down to tiny toes with fleecy Cheeky Monster Baby Bootees or Mary Janes. There are also plenty of colourful cotton bootees which are just gorgeous and perfect for the warmer months. To see the massive collection available head on over to Little Odd Forest. International delivery is available to Australia.